In some hot and humid archipelagos, “island cuisine” is shorthand for frozen fish flown in from far away and sweet, boozy drinks with plastic monkeys hanging from sugar-coated rims. Not so in our San Juans. The green islands with blue bays (there are more than 170 named isles, all north of the Strait of Juan de Fuca) are as beloved for their food as for their beauty—especially two of the largest, San Juan and Orcas islands. Think: Oysters you shuck and slurp on the beach, fat pears, spicy cider. You won’t find these taste sensations in Seattle, because they are farmed, fished and foraged in such small quantities that they get gobbled up on the islands and don’t even make it to the mainland. Once upon a time, back before dams brought irrigation to eastern Washington, much of Seattle’s produce came from farms and orchards in the San Juans. 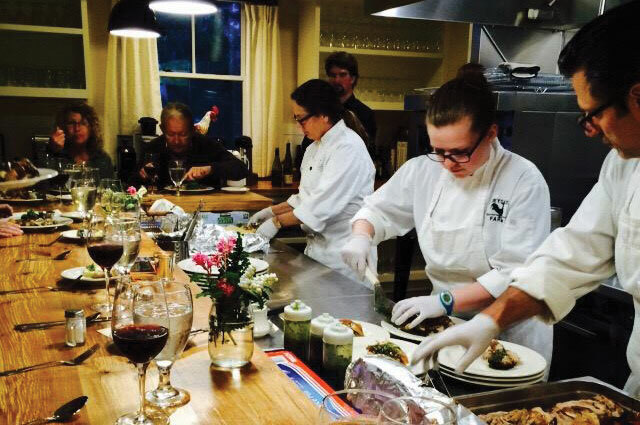 These days, a new generation is reviving that agricultural tradition and hosting city-weary visitors at farms, where you can immerse yourself in rural bliss for a night or two; savor heirloom, organic and wild harvests; and return home recharged. On the western edge of this horseshoe-shaped island, Pebble Cove Farm (about 6 miles from the ferry dock at Deer Harbor; 360.376.6161; pebblecovefarm.com) is almost laughably bucolic. A sample view from the deck of the studio suite: A red pony and a silly white rooster respectively munch and peck their way across an Ireland-green pasture that ends at a saltwater beach. A rowboat moored out front is free to use for a paddle out to the tiny, uninhabited islands nearby. The farm also features the aforementioned critters along with goats, lots of colorful chickens and an orchard and big garden from which guests are encouraged to harvest dinner. In August, there are tomatoes, green beans, artichokes, potatoes, zucchini, basil and fava beans. Fresh-laid eggs are available for the taking; just slide open the little doors on the back of the chicken coop, nudge the hens aside and grab what you need. In your pretty room, the kitchenette is supplied with thoughtful goodies: oil, vinegar, butter and milk—everything you need to whip up a feast on the little portable burner. Once in a Blue Moon Farm (about 3 miles due north of the ferry in West Sound; 360.376.7035; onceinabluemoonfarm.com) is not as polished as Pebble Cove, but in your big unit above the barn, you get a real kitchen, homey furniture and cheery yellow paint. There’s no beach, but ponds ensure a chorus of frogs at night. The culinary star at this historic farm is fruit. Old, gnarled pears include the rare heritage Orcas pear, while the newer orchards feature quince, and you’ll also find plums, peaches, hazelnuts and apples. Then there are the eggs from the chickens and geese. Do I smell cobbler? All of this harvesting and eating is enough to make one thirsty. What could be better than a local libation? At Island Hoppin’ Brewery (Eastsound; 360.376.6079, islandhoppinbrewery.com), four young entrepreneurs have created a not-to-be-missed neighborhood hot spot in an easy-to-miss industrial location in Eastsound, at the top of the horseshoe. “There are no TVs or clocks,” says brewer Becca Gray, “but lifelong friendships have formed here while people enjoy the fine things of life,” such as conversation, pingpong and beer. The best play here is to order a flight of beers: The small-batch ales and lagers all sing with a clean freshness, but their personalities are distinct. Pick out a favorite and take home a growler—the perfect souvenir of your tasty island weekend. 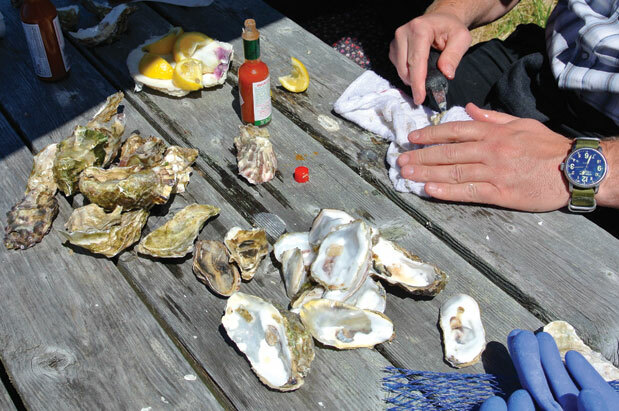 For an overnighter on San Juan Island, zip about 10 miles northwest direct from the ferry to the iconic Westcott Bay Shellfish Company (Roche Harbor; 360.378.2489; westcottbayshellfish.com) to celebrate its salvation. Just when it looked like this idyllic cove in the northwest corner of San Juan Island would be divided up for vacation homes, locals Erik and Andrea Anderson bought the oyster farm, where they’d spent many summers tying up at the dock and picking plump Pacifics out of the cold water tanks. After two years of rebuilding and seeding miniature mollusks, this is the first summer all the oysters, clams and mussels from this very spot will be for sale, revealing that signature Westcott Bay flavor; crisp, creamy and salty, with a hint of cucumber. Next, chase the freshest shellfish on the planet with local spirits, conveniently located nearby at the San Juan Island Distillery (Roche Harbor; 360.378.2606; sanjuanislanddistillery.com). How about a bracing herbal martini to follow oysters on the half shell? The distillery’s vermouth (expected to be available by August) will make an incredible martini with Spy Hop gin crafted from locally foraged botanicals, such as Douglas fir and rose hips. Prefer mellow yellow cider with those buttery clams? The distillery also has been making Westcott Bay cider here since 1999, using vintage apples grown in its San Juan orchard and dubbing the results with names such as Dabinett and Sweet Coppin. Taste your way through the varied lineup, including brandy and eau de vie, at festive tastings on Saturday and Sunday afternoons from 1 to 4 p.m.
Now, all that’s required is the perfect bolt-hole to savor your goodies, one that comes with a kitchen, barbecue, sunset view and comfy bed. Just a few minutes’ drive away from the distillery, there is an old resort that’s so off-the-radar wonderful, we almost don’t want to mention it. Lonesome Cove Resort (near Roche Harbor; 360.378.4477; lonesomecove.com) is now just a few tidy 1940s log cabins in a semicircle above a sandy crescent beach with a view over the prairie of Spieden Island and the serrated peaks of Canada’s Coast Mountains. All we ask is that, as you barbecue some oysters under the tangerine glow of a Northwest summer sunset, you keep Lonesome Cove just between us, Pinky swear? Accessing the main islands in the San Juans requires a bit of planning, but it’s well worth the effort. The Washington State Ferries (wsdot.com/ferries) introduced a seasonal reservation system this year—available through September 19—that aims to reduce car waiting times at the Anacortes ferry terminal. (Note: Walk-ons never require reservations.) Although the first one-third portion of reservable space for summer sailings has already been released, another third becomes available at 7 a.m., two weeks before each sailing date, and an additional third is released at 7 a.m. two days before each sailing date. If all of that sounds too complicated, don’t worry: Reservations aren’t required. You can always show up and wait (and wait some more). 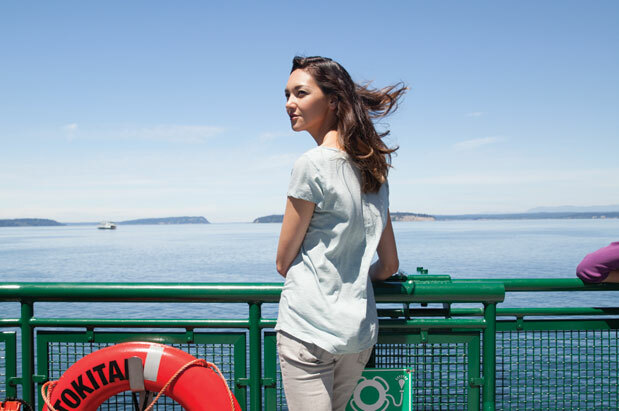 To plan your crossing during a slower time of day or week, visit the “Best Travel Times” feature on the ferry website to pinpoint the least congested sailing times. Allow two hours’ driving time from Seattle to the Anacortes ferry terminal. Sailing times to the islands range from 40 minutes to more than two hours. To Orcas: $40.95 with vehicle, $12.95 walk-on. To San Juan Island: $48.60 with vehicle, $12.95 walk-on. A quicker (but more expensive) option for reaching the islands is via Kenmore Air (one way $130–$160; 866.435.9524, kenmoreair.com) aboard a seaplane departing from Kenmore, Lake Union or Boeing Field and arriving on Orcas, San Juan or Lopez Island. Flying dispenses with driving time and ferry waits, but it leaves travelers without transportation on the island; an inconvenience if exploring is on the agenda. 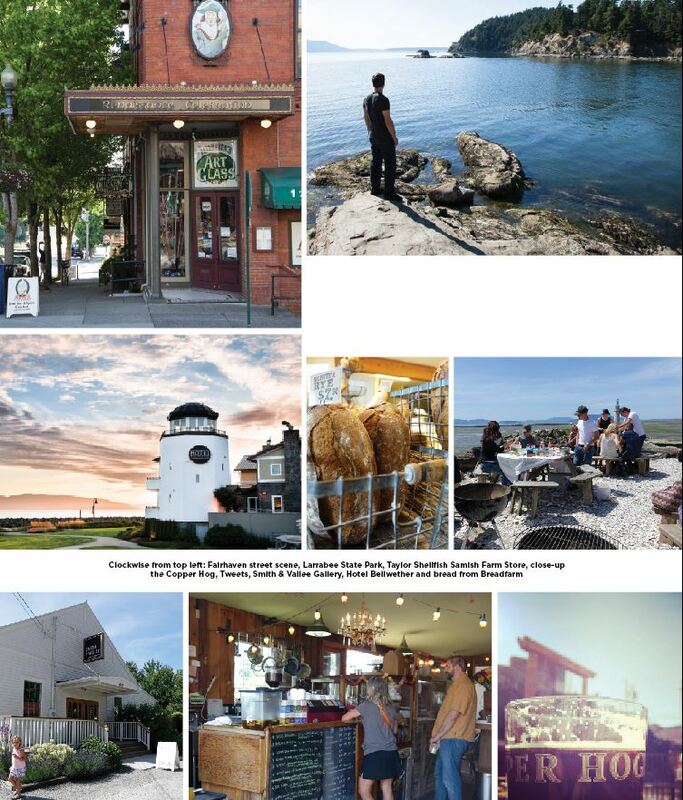 Located at the south end of Whidbey Island, Langley has always been a favorite for book lovers and art enthusiasts, but during the past year, new shops and eateries have infused the town with a decidedly kinfolk aesthetic. Just a 20-minute ferry ride from Mukilteo (less than an hour’s drive up Interstate 5 from Seattle), this quaint seaside town offers a highly curated escape. Shop like a hipster: Kalakala Co. Mercantile (138 Second St.; 360.221.0161; kalakala.co) is essentially a café that sells such beautiful things that you forget to eat your food. Start with the esoteric café menu (for example, kimchi deviled eggs and shoyu ramen), then browse local pottery, artwork and artisanal soaps before sitting (carefully) at the swaying 8-foot-long communal table suspended from the ceiling by thick rope. One street over, the new shop and gallery Edit, or, as they would have it, edit. (306 First St., No. 101; 360.221.7909; editwhidbey.com), maintains a similar spare aesthetic and devotion to local producers. On the walls, owner/artist David Price’s muted encaustic works play off his Picasso-inspired bulls’ heads, while the shelves sprout Whidbey-made serving boards, Douglas-fir-tip tea and pretty linens. And Langley’s must-visits are still there: Step into The Star Store (201 First St.; 360.221.5223; starstorewhidbey.com), an almost century-old shop that now redefines the modern mercantile with everything from tea bags to Toms. Refuel at Useless Bay Coffee Company (121 Second St.; 360.221.4515; uselessbaycoffee.com), whose Athena latte, made with honey and cinnamon, will make you rethink any aversion you may have to sweet drinks. Dine on the edge: For dinner, challenge the way you think about food at the Inn at Langley (400 First St.; 360.221.3033; innatlangley.com), where chef Matt Costello still stuns diners with course after course of inventive, island-inspired fare. For dessert, try a Turkish coffee served in the form of a small glass terrarium, with layers of coffee, cardamom and black pepper “soil,” sponge cake “moss” and edible blossoms from the garden outside. Couples should splurge on the Saratoga Suite at the Inn at Langley, where two can comfortably watch for whales from the bathtub while sipping bubbly (after a spa treatment, naturally). At high tide, the second-story suite, really more of a luxury apartment, feels like it’s actually floating above the water. 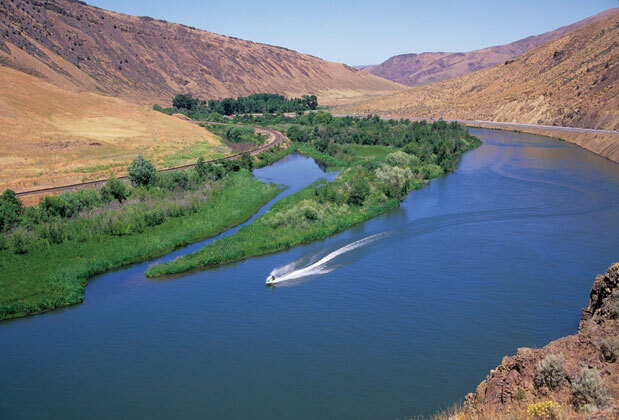 Montana may be known as Big Sky Country, but Ellensburg, Washington, with its rolling hills covered in swaying timothy hay and the Yakima River running through it, is a close approximation in both spirit and setting. Especially when you make the rustic, tucked-away Canyon River Ranch (14700 Canyon Road; 509.933.2100; canyonriver.net) your home base. Hop over the Cascade Mountain range via Interstate 90 and drive past the main Ellensburg exits—just two hours from Seattle—and head south on Canyon Road (exit 109), which snugly winds along the base of steep basalt cliffs; keep an eye out for mountain goats perched high above. Rustic timber framing and stacked-rock chimneys welcome guests to the lodge, where the air feels cleaner and you’ll breathe a little deeper as soon as you step onto your private outdoor patio overlooking the Yakima River. Cast your line: You’ll likely spot folks taking fly-fishing classes on the wide riverside lawn; Red’s Fly Shop (509.933.2300; redsflyshop.com), located at the southern tip of the lodge, helps city slickers dust off their skills (or learn new ones) and offers guided floats down the river, too. There are also hiking trails and horseback rides, if that’s more your speed. Sample the local delights: Just be sure to end the day on the shady deck at the ranch’s Canyon River Grill (509.933.2309; canyonriver.net/canyonrivergrill) with a cool glass of Mourvèdre rosé from Naches Heights Vineyard—or maybe a pint of Bale Breaker brew (both just down the road in Yakima). The Ellensburg-area brewing scene is vibrant and just keeps getting better; be sure to check out anything from Roslyn or Iron Horse breweries. Sandwiches, flatbread pizzas and other pub food keep the kids and the fisher-people happy. Speaking of kids, there’s an outdoor pool. Just don’t be surprised if you find other ways to pass the time; throwing rocks into the river ain’t such a bad way to while away a summer afternoon. Pottery Barn meets Little House on the Prairie at Bainbridge Island’s Heyday Farm (4569 Lynwood Center Road NE; 206.201.1770; heydayfarm.com), where the name of the game is connecting people with the source of their food in an authentic and charming setting. With two classic farmhouses and a barn on a total of 25 acres, plus dairy cows, hens, and lavender, raspberry, strawberry and blueberry bushes, you’ll forget you’re so close to the big city (a 35-minute ride from Seattle and few miles’ drive from the ferry—to get literal about it). The farm recently got Wi-Fi, but why not pretend it didn’t? You’ll most likely be greeted by Craig or Alice Skipton, who settled at the farm in 2011. They left Seattle for the rural life, and they’ve never looked back. The couple has restored the 1890s farmhouse and property into a warm and welcoming farm-stay fantasy with all of the modern amenities, yet you can easily slip away into a tranquil planting session, a cooking class in the well-equipped, laid-back kitchen or a cow-milking experience with heifers named for Susan B. Anthony and Rosa Parks. Don’t miss the exceptional guided Tasting and Farm Tour or the Farm Breakfast and Tour. If you’re lucky, you’ll be around for a Heyday Farm Dinner, which kicks off with live, foot-stomping Americana music (maybe the Squirrel Butter Band) and tasty bites (perhaps tomme cheese, compliments of Rosa) before sitting down in the dining room for local pork, fresh veggies from the garden, perfectly paired wine—and sweets to top it all off. Cedarbrook Lodge (18525 36th Ave. S; 206.901.9268; cedarbrooklodge.com) is a luxury hotel in an unlikely location: within view of Seattle-Tacoma International Airport. Situated on 18 acres of protected wetlands, this former conference center has been tricked out with 169 plush guestrooms—60 of which were opened in 2014 as a part of a deluxe expansion that also included a new luxury spa. The Copperleaf with its Northwest-inspired menu is a revelation, thanks to the innovative executive chef Mark Bodinet, formerly of the French Laundry restaurant in Napa Valley. Floor-to-ceiling windows in the well-appointed guestrooms bring in the lush wooded surroundings, and impeccable soundproofing means airplane traffic, and your stress, all but disappears. You say tomato: The Spa at Cedarbrook takes the farm-to-table movement to a new extreme with a suite of “Taste and Touch” services that run parallel to what’s on the menu at the Copperleaf. For example: While the Tomato Lime Brightening Facial may be used to freshen your face, the restaurant may serve seared Neah Bay halibut with heirloom tomato gazpacho. Snack attack: When the midnight munchies strike, slip on your comfy pants and venture down to one of the property’s three cozy “living rooms,” where signature gourmet malted milk balls await. These sweet treats—along with ice cream, string cheese, yogurt and bottled water—are complimentary and available around the clock. Standing sentry at the northwesternmost tip of our state, practically a stone’s throw from the Peace Arch border crossing (you can see Canada from here! ), is the long, bright yellow, 212-room, shake-shingled Semiahmoo Resort (Blaine, 9565 Semiahmoo Parkway; 360.318.2000; semiahmoo.com), a beacon for those seeking Northwest-meets–East Coast weekend retreats. Most impressive is the Pierside Kitchen restaurant: The relaxed, beachy-elegant dining room, with its whitewashed wood, opens up to sweeping views of Semiahmoo Bay and the resort’s tidelands. Culinary director Eric Truglas goes ultralocal with a robust garden on the property, and his onsite bakery churns out carb-tastic treats, on display atop the kitchen counter. (The adjacent Packers Oyster Bar serves upscale pub fare and cocktails.) All the trappings of a posh resort are here: a robust, full-service spa; an outdoor pool that’s heated to 85 degrees and open all year; racquetball, indoor and outdoor tennis, and one of the most well-designed running track/workout spaces we’ve ever seen; as well as seemingly endless dining, party and meeting spaces. Two days is just not enough to soak it all in—but it’s a good start. 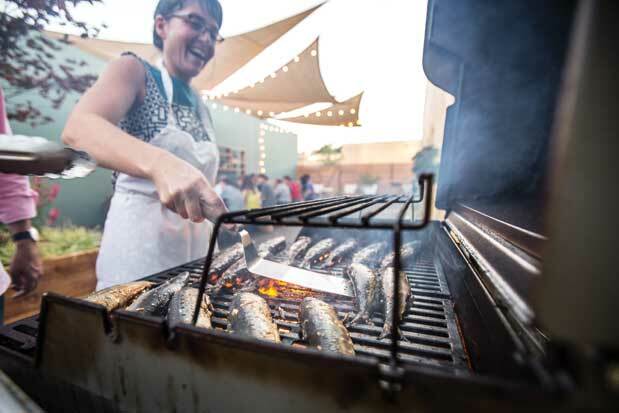 Get there in time for dinner: Start the 90-minute drive (with no traffic) north early to make it to the Friday Night Backyard BBQ (6–9 p.m., through September 11; $29.95 for adults, $14 for kids 6–12) on the back lawn—an event that’s become a weekly summer ritual for locals and guests alike. With white wood tables and chairs, a live band, a tasty buffet, craft brews and s’mores fixin’s at the beach bonfire, it feels like you’re crashing somebody’s awesome wedding in the Hamptons. 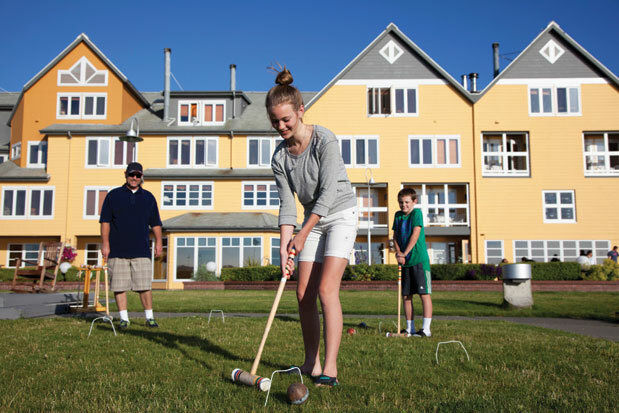 Hit the greens: Semiahmoo Golf & Country Club and Loomis Trail Golf Club are nearby, but not so close you feel as though you’re vacationing in the middle of a golf course, if that is not your thing. 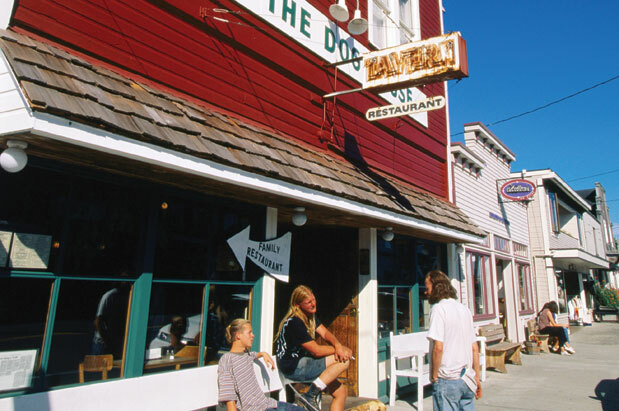 Take in some history lessons: Rustic, Instagram-worthy evidence of the area’s Native American fishing and cannery histories abounds, including the Alaska Packers Association Museum, just a short walk or bike ride down the spit from the resort; along the way, you can say hello to the lolling seals and their pups. Long an artist haven on the Olympic Peninsula, Port Townsend is home to creators, craftspeople and independent thinkers; the word “artisan” isn’t a trendy marketing slogan there, it’s a way of life. Why not, try it for a weekend? Sip and shop: Line-caught salmon, goat cheeses made on a nearby farm and organic free-range eggs are what’s for breakfast at Better Living Through Coffee (100 Tyler St.; 360.385.3388; bltcoffee.com), where the wild salmon quiche is perfection and the organic drip coffee is brewed by the cup, all with a view of sailboats bobbing in the cool waters just outside. Wander through eclectic shops on historic Water Street, where locally crafted jewelry and watercolor paintings fill numerous galleries. Get into the steampunk spirit (Port Townsend is a Victorian seaport, after all) at World’s End (1020 Water St.; 360.379.6906; worldsendporttownsend.com), a shop dedicated to pirate-inspired and steampunk fashions. End the day with dinner at the Fountain Café (920 Washington St.; 360.385.1364; fountaincafept.blogspot.com), where seafood and farm-fresh produce are carefully prepared in a warm, snug dining room just off the main drag. Get down: Whether it’s foot-stompin’ bluegrass, bluesy country or indie rock, Port Townsend’s Sirens (823 Water St.; 360.379.1100; sirenspub.com) puts local musicians on stage every weekend, the music spilling outside onto the deck perched over the bay. Up a flight of stairs, Sirens is a bit hidden, but inside, all generations (except those younger than 21) sip locally brewed craft beer (Propolis and Port Townsend Brewing) or cider (Finnriver and Alpenfire are both made nearby) along with plates of fried local oysters. Pillow talk: VRBO is a good way to go in Port Townsend, especially if you have an aversion to bed-and-breakfasts and old lace curtains. But The Swan Hotel (222 Monroe at Water Street; 360.385.1718; theswanhotel.com) is a reliable choice; you can rent a studio with a shared patio and views of Point Hudson Marina and Admiralty Inlet. 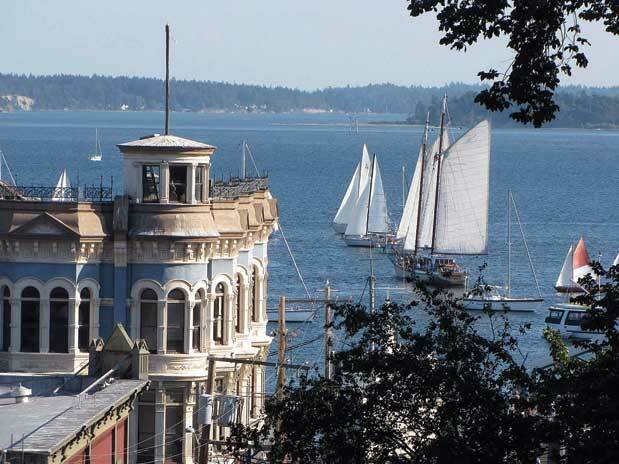 With its sweet, small-town vibe, bayside breezes and some of the best brews in the state (as well as food finds that, in themselves, justify the trip), a weekend in Bellingham just might become an annual affair. Begin with a leisurely Saturday-morning start (Bellingham is less than a two-hour drive from Seattle), grabbing State Route 11 North off Interstate 5 at Burlington for the scenic Chuckanut Drive route; idyllic farm country—barns and meadows, blueberry farms and fields being plowing by tractors—is a balm for frazzled nerves. Stop in adorable, tiny Edison for the best lunch you’ll have all year at Tweets (Edison, 5800 Cains Court; 360.820.9912; tweetscafe.com). Pray that the gently cold-smoked salmon niçoise is on the menu that day, with its snappy garden beans and tender greens, house-made pickled veggies and eggs from the chef’s friend’s backyard coop. (Bring cash.) The portions are generous, and the food is as fresh and pure as it gets. Stop by the Smith & Vallee Gallery (Edison, 5719 Gilkey Ave.; 360.305.4882; smithandvallee.com), one of several artful shops packed into the short main drag, to peruse local art and handcrafted furniture. Wander and Kulshan—but a stop at the Copper Hog (Bellingham, 1327 N State St.; 360.927.7888; thecopperhog.com) is a lot less work. There, you’ll find an excellent array of regional brews along with upscale pub grub (think roasted trout or wild boar ragu over house-made gnocchi). On Sunday, wake up with soft pretzels from Ralf’s Bavarian Bakery (Bellingham, 207 E Maple St.; 360.733.3066; ralfsbakery.com). Fairhaven is just minutes away, with its historic brick buildings on hilly streets, housing quaint boutiques and petite cafés. Or spend the day hiking in Larrabee State Park (Bellingham; parks.wa.gov/536/Larrabee) followed by a stop at Taylor Shellfish Samish Farm Store (2182 Chuckanut Drive; 360.766.6002; taylorsamish.com) for an “impromptu” half shell oyster barbecue—they have grills and oyster knives—just bring your own bottle of chilled white wine or bubbles. You’ll probably find yourself sitting and staring out at the oyster beds in the bay, salty, cool wind in your hair, while starting to plan your next trip north. Getting away from it all is as easy as heading to the South Sound via the Tacoma Narrows Bridge or by catching the Bremerton ferry for the hour-and-a-half trip to Alderbrook Resort & Spa (Union, 10 E Alderbrook Drive; 360.898.2200; alderbrookresort.com). Since 1913, generations of visitors have enjoyed the rustic charm of this canal-side retreat on 88 acres, which include an 18-hole golf course. Its 77 guest rooms are ideal for a quiet escape, while 16 cozy cottages on the other side of the property are perfect for family fun. The resort’s resident cats, Alder and Brook, snooze away in the sun in the soaring lobby, and a sweeping lawn leads down to the beach, where oysters are harvested in the cold months and swimmers frolic in the warm ones. Don’t miss the chance for bliss at the excellent day spa. Treats and eats: Savor the flavors of Hood Canal at the 13th annual Taste of Hood Canal (tasteofhoodcanal.com), just 14 miles up State Route 106. The free event on August 8 features a beer garden, live bands, food booths and a classic car show. Can’t see leaving the resort? 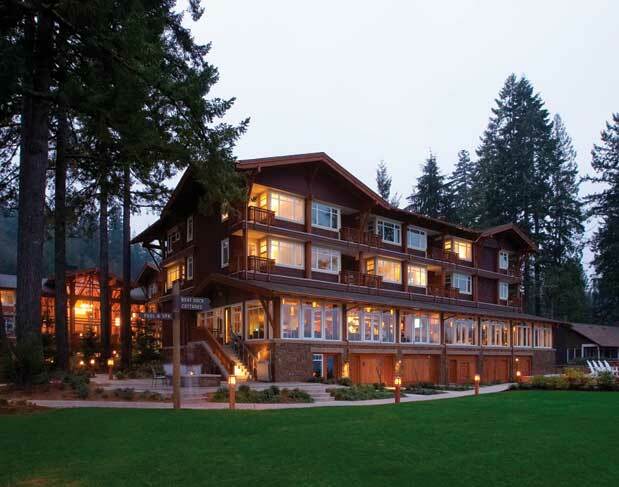 The Restaurant at Alderbrook’s menu is a local food fest in its own right. Replete with seafood, natch (such as the Hood Canal seafood boil, featuring Alderbrook clams, Penn Cove muscles, Dungeness crab and jumbo prawns), it also includes an array of steaks and pastas. The kids’ menu offers more than the typical mac and cheese. Everyone is happy. 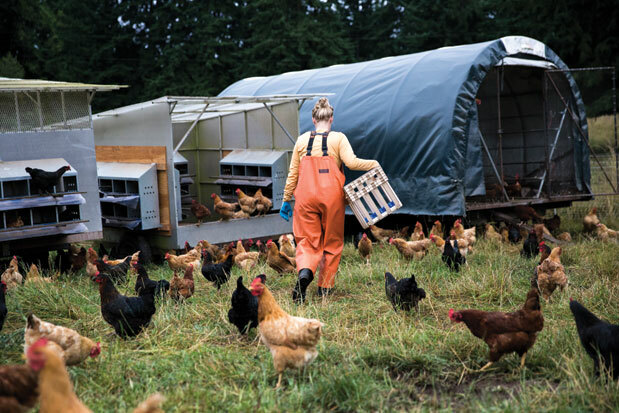 Reaching Vashon Island’s rolling hills and forests, dotted with goat-, chicken- and horse-filled farms, is a cinch (and lovely to boot) via a short 20-minute water taxi ride from downtown or car-ferry ride from West Seattle. Once you disembark, you’ll feel the shift immediately—and it’s more than the view. People here live the quiet, artsy-fartsy, laid-back life, but the sometimes-quirky locals are always friendly. It’s also an outdoor lover’s paradise, drawing cyclists (beware: hills ahead), kayakers, canoers and hikers from the mainland. If you fail to bring a bicycle or boat, no worries, there is plenty to do beyond the outdoorsy thing: Stroll the Vashon Farmers Market, Saturdays on the Village Green; sip locally made vodka, gin, whiskey or coffee liqueur at Seattle Distilling Company (19429 Vashon Hwy. SW; 206.463.0830; seattledistilling.com) or take a Point Robinson Lighthouse tour any Sunday through mid-September (call Captain Joe, 206.463.6672). Book a table well in advance for dinner at May’s Kitchen + Bar (17614 Vashon Hwy. SW; 206.408.7196; maykitchen.com) for arguably the best food on the island. The small Thai restaurant, from the owner of the famed May Restaurant & Lounge in Wallingford, is a favorite of islanders and visitors alike, and fills up faster than the ferry on a hot summer day. Great breakfast options include a classic rib-sticker menu at The Hardware Store (17601 Vashon Hwy. SW; 206.463.1800; thsrestaurant.com) or a massive breakfast burrito from Zombiez (17705 Vashon Hwy. SW; 206.463.7777; Facebook, “Zombiez”). And vegetarians will think they’ve died and gone to the big veggie patch in the sky at the seriously vegan/raw-focused Pure Organic Café & Juicery (9925 SW Bank Road; 206.259.3179; Facebook, “Pure Vashon”) and Snapdragon (17817 Vashon Hwy. SW; 206.463.1310; vashonsnapdragon.com), with the latter offering excellent baked goods and an eclectic live music scene every Wednesday and Sunday. Until this summer, finding a place to stay on the island had been hit or miss, but now you have the option of a mini-lodge of your own at The Lodges on Vashon (17205 Vashon Hwy. SW; 206.498.2197; lodgesonvashon.com) right in the two-stoplight downtown. 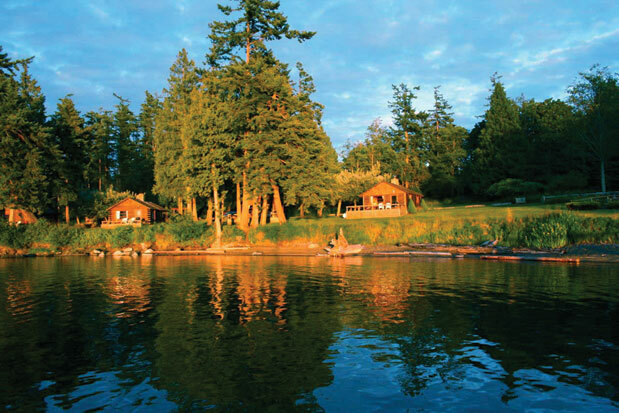 Each “Northwest modern” cottage is stocked with locally made amenities, from the soap to the furnishings. Staying here means you can leave the car at home as most everything is within walking distance, and the bus service runs from the ferry terminal to The Lodges. 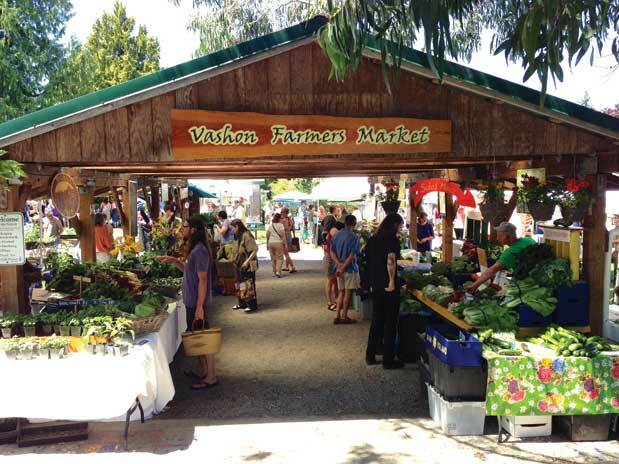 Plan your trip to coincide with one of Vashon’s many weekend festivals. If camping is your jam: Pack your canoe or kayak and a tent for the Raft Up! Festival, August 16–17 (206.463.5511; vyfs.org/raftup). Vashon’s celebration of music, nature and community is also one of the few chances to actually camp on the island! Portland may be a city of tattooed hipsters keeping it weird, but it’s first and foremost a city of makers. A current of can-do creativity steeped in collaboration and bootstrapping independence runs through the city. Luckily for food lovers, a wealth of that culinary entrepreneurship has convened in the Central Eastside Industrial neighborhood, in a mile-long loop informally dubbed the “artisan corridor.” There, you’ll find some of the city’s best coffee roasters, breweries, urban wineries, artisan food producers and restaurants—all concentrated in one spot for an easy weekend of exploring. 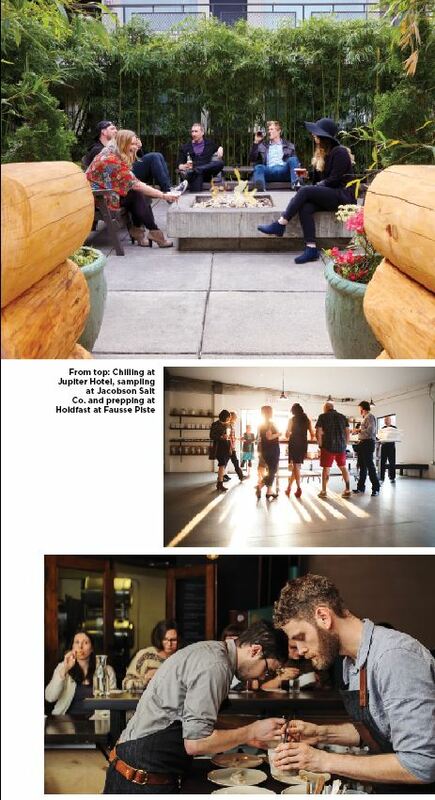 Set up your base of operations at the Jupiter Hotel (800 E Burnside St.; 503.230.9200; jupiterhotel.com; ask about the Brews and Booze Experience), a minimalist boutique hotel—with the kickin’ Doug Fir Lounge music venue across the courtyard—that is a hub for hipsters. It’s just a few blocks from the action. When you’re ready to explore the artisan corridor, rent one of the Jupiter’s Electra bikes or head out in comfy shoes and use the new eastside streetcar line to work your way up or down the Martin Luther King Jr. Boulevard and Grand Avenue couplet. Properly jet-fueled, you can continue your artisan exploration at Jacobsen Salt Co.’s airy tasting room (open weekdays only; 602 SE Salmon St.; 503.473.3952; jacobsensalt.com), where there’s an array of sweet and savory products using salt harvested from the Oregon coast. The company recently partnered with Bee Local honey, which means you can also pick up micro lots of honey made from hives tucked onto rooftops all across town. Around the corner in the buzzy building that houses Renata restaurant, you can watch cheesemakers at their craft through the window at the award-winning Ancient Heritage Dairy (1311 SE Seventh St.; ancientheritagedairy.com), Portland’s only urban dairy. You can’t go in, but you can pick up its sheep’s milk cheeses and more at Mi Piace next door, the commissary of Portland-made artisan foods inside Renata, the Italian-inspired restaurant opened in June by a couple of French Laundry alums. Around the corner is the brand-new second outpost of beloved Alma Chocolate (1311 SE Seventh Ave.; 971.279.4133; almachocolate.com), where you can pick up Thai peanut butter cups and toffee barks, and see the chocolatiers at work. Distillery Row (distillerypassport.com), which is a stretch of seven small-batch spirits producers, starts just a few blocks east. Don’t miss the House Spirits tasting room. Or, on the northern end of the loop, the Wild Roots tasting room, where triple-distilled vodka is blended with farm-fresh fruit. If wine is more your speed, stop in for a tasting at Fausse Piste (537 SE Ash St.; faussepiste.com) or Clay Pigeon (815 SE Oak St.; 503.206.7862; claypigeonwinery.com) urban wineries. Both specialize in Pinot Noir, and both share space with fantastic restaurants. Holdfast at Fausse Piste (holdfastdining.com) is a multicourse, reservation-only, fine-dining destination, while Clay Pigeon shares space with Cyril’s (cyrilspdx.com)—a comfortable, laid-back wine bar run by a serious cheese expert. If you really want to take a deep dive into wine, Cooper’s Hall (404 SE Sixth Ave.; 503.477.8177; coopershall.com) features about 30 wines on tap from the Northwest, including its own wines, made just steps from your table. Of course, since this is Portland, there’s no shortage of beer. In addition to excellent tap lists at the area’s bars and restaurants, there are aged, collectible beers at venerable Hair of the Dog (61 SE Yamhill St.; 503.232.6585; hairofthedog.com), and gluten-free brews at Ground Breaker (2030 SE Seventh Ave.; 503.928.4195; groundbreakerbrewing.com). It’s all about sour beers at Cascade Brewing Barrel House (939 SE Belmont, 503.265.8603; cascadebrewingbarrelhouse.com), while Burnside Brewing and Base Camp Brewing are both hop havens. Over at The Commons’ (630 SE Belmont; 503.343.5501; commonsbrewery.com) brand-new brewery, Belgians and farmhouse ales reign, and The Loyal Legion (710 SE Sixth Ave.), slated to open at the end of July, prides itself on a whopping 99 taps of Oregon-only brews. All that exploring will work up an appetite, and the area’s restaurants offer a range of low-end and high-end options that will keep you filled up from breakfast through late night. Olympia Provisions (107 SE Washington St.; 503.954.3663; olympiaprovisions.com) is perhaps the most famous food producer in the area, and you can taste the entire range of its bounty at its full-service restaurant, which is open for lunch, dinner and weekend brunch. Renata is perhaps the most talked-about newcomer, but don’t miss the ramen at Biwa spinoff, Noraneko (1430 SE Water Ave., 503.238.6356; noranekoramen.com), open until the wee hours. And be sure to save room for pelmeni dumplings and horseradish vodka at Kachka (720 SE Grand Ave.; 503.235.0059; kachkapdx.com), a darling outpost of Russian drinking snacks that’s one of the hottest restaurants in town. Nostrovia! 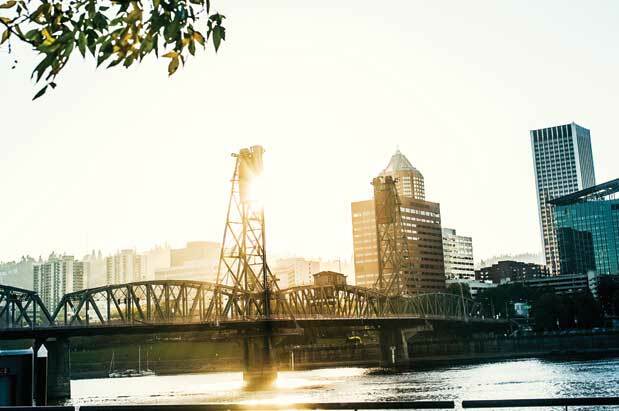 Portland is a two-and-half hour straight-shot down Interstate 5—if you don’t hit traffic. Cut out the stress, and let someone else drive by taking a Wi-Fi enabled Amtrak train from King Street Station to Portland’s Union Station (4 hours; $26–$63; amtrak.com). Or get there via the BoltBus from King Street to downtown Portland (3.5 hours; $15–$30; boltbus.com).